Currant Creek Reservoir is a beautiful lake that is not much farther from the Wasatch Front than Strawberry Reservoir, but is much less crowded. Currant Creek provides excellent fishing for native Cutthroat Trout as well as Rainbow Trout. The shoreline is 85% owned by the Uinta National Forest. The other 15%, in the Coal Mine Hollow Area, is privately owned with restricted access. 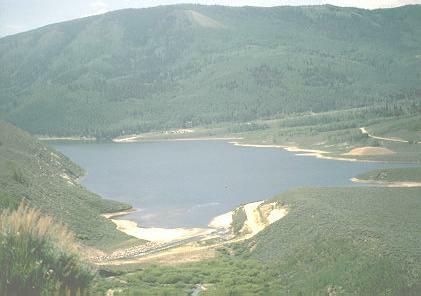 Currant Creek Reservoir is easily accessible from US-40 between Fruitland and Strawberry Reservoir. At milepost 59.3, the highway is in the bottom of Currant Creek Canyon, with large signs directing traffic to the turnoff in the canyon bottom. The Currant Creek Cafe, at the turnoff, has gas, food, fishing licenses, and other services. Travel up-canyon for about 14 miles on an improved gravel road to the reservoir. A barrier-free fishing platform exists at the campground. Reservations are accepted for certain campsites, and others are first-come first-served. Fees are charged for camping. Facilities and improvements include paved roads & parking spurs, flush toilets, dump station, boat ramp, handicap accessible fishing pier and playground. From Heber City, follow US Hwy 40 East (towards Strawberry) for 45 miles to the Currant Creek Junction, which is between Fruitland and Strawberry Reservoir. At milepost 59.3 turn North and travel about 14 miles (gravel road).